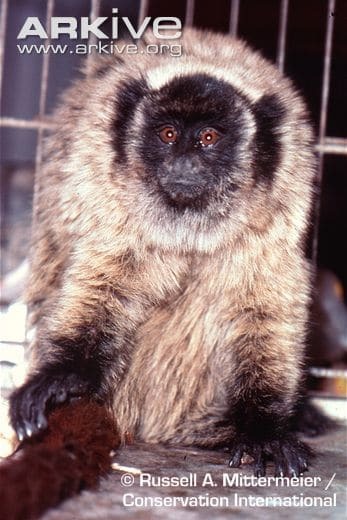 The Northern Bahian Blond Titi was discovered by Hershkovitz in 1990. It inhabits Brazil. It is currently (2003) listed as a critically endangered. This species is also endemic to Brazil. They are pale grey in colour. Their hands and feet are a black colour, whilst their tail shows a tint of orange. The Black-fronted Titi is a frugivorous species, thus primarily feeding on fruit. They have also been reported to feed on insects and leaves. They are arboreal meaning they rarely travel to the forest floor. They have a monogamous mating system, and will live throughout their life with the partner and any offspring. They give birth from August through October. It is sometimes referred to as Barbara’s Brown Titi. E-mail to add your Northern Bahian Blond Titi related website.